We have slowly, and we emphasize slowly, been painting and making it our own. We have tended to do more work on the smaller rooms, since we can usually tackle it in a weekend. 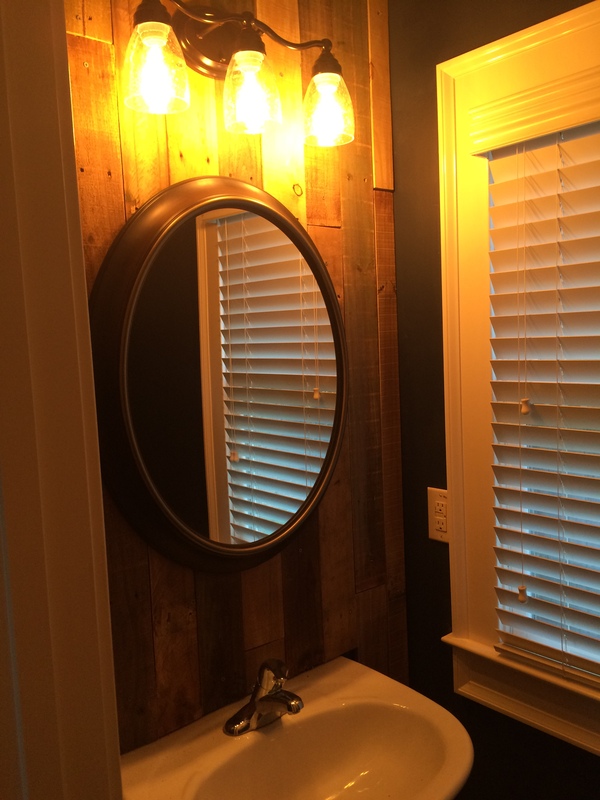 Our latest project – the downstairs half bath. 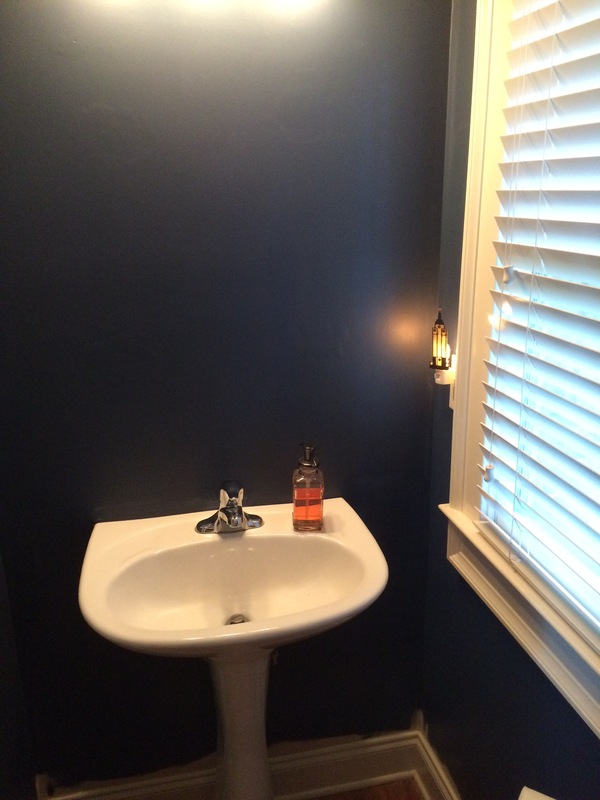 The room is pretty small with a pedestal sink, toilet and has lovely “contractor tan” walls. We wanted to put our own personal spin on the room, so we did the first thing anyone does that is cheap and easy: paint. We picked a midnight-esque blue that would pop against the white ceilings and the large crown around the doors and baseboards. We know what you are thinking – “dark paint makes a room feel smaller.” But we decided to take a chance and it worked out perfectly! Next, we wanted to do something with the one floor to ceiling wall in the room (since the bathroom is under the stairs). 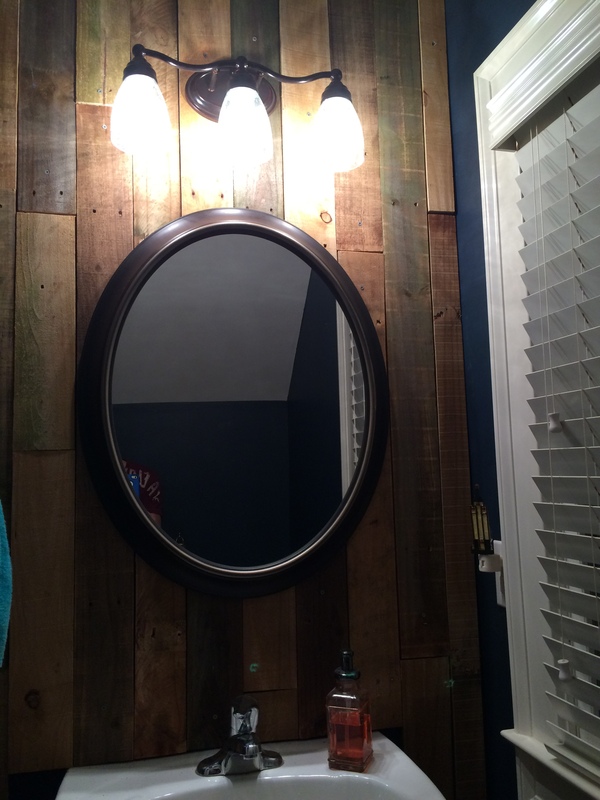 We had some privacy fence left over from when a massive tree limb fell on the fence shortly after we moved in (that is a story for another day), so we decided to do a barnwood wall. Worried this could turn into a Pinterest fail, we measured to make sure we had plenty of wood to make it from floor to ceiling. We also decided to go with a vertical pattern rather than a horizontal pattern. We thought it would make for a different “feel” and make the room appear taller. 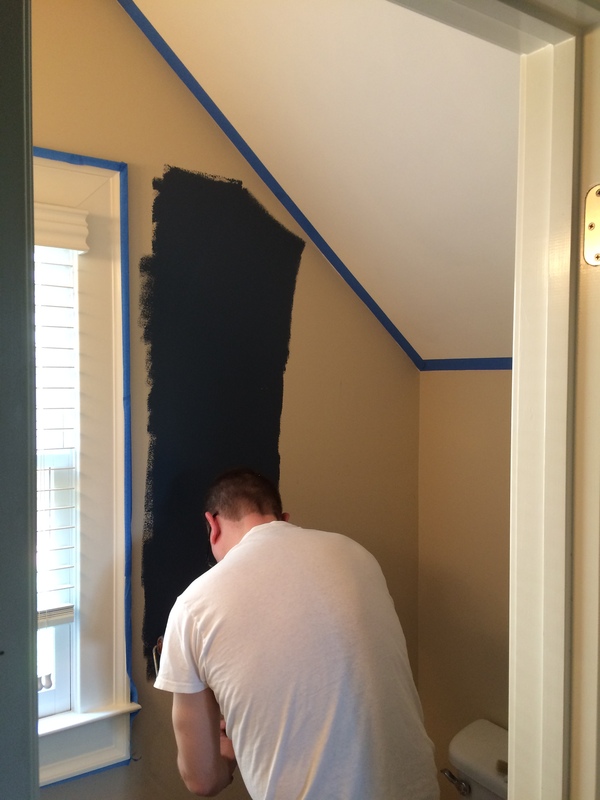 We ended up painting the large wall blue as well and then got to measuring and cutting. We attached it using construction all-purpose adhesive that dried in about 10 minutes. It only took about 4 hours from start to finish, including custom cuts around where the light fixture goes. Trey picked out a beautiful antique bronze light fixture with clear, bubbled antique glass globes. For the bulbs, we originally got the large Edison bulbs. I have been wanting to get some of these bulbs for YEARS, but we couldn’t find a place to use them where they would truly be on display. Plus at $10 a piece, the cost just wasn’t worth it. So this time, we splurged! After all was said and done, the bulbs didn’t go with the room. Turns out, they give off quite an orange glow and made the bathroom feel more like a haunted house than something fresh and crisp. On to the next project….